I recently had the opportunity to try out Ooka Island. I had heard good things about the online program, and I wanted to see if it was something that would work well in my classroom. (I'm thinking workstation possibility). Well, I don't have access to my classroom kiddos (only 7 more days! ), but I do have a couple 3 year old granddaughters I could use as my guinea pigs. Ooka Island is billed as a "Learn to Read Game for Ages 3-7"...so I figured that was reasonable. Now, there really are a ton of 'reading' websites out there...so I looked into this to make sure it had the stuff to do the job. I found that it's based on research. 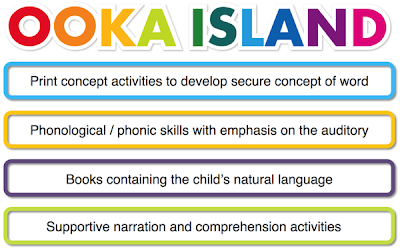 Ooka Island uses the Eye/Ear Reading Method-- children learn to use both their visual and auditory skills to master the building blocks of reading. Compared to other reading websites, I thought this was impressive: "The Eye/Ear Reading Method is embedded into the system and includes 562 meticulously scaffolded phonological skill activities and a built-in e-Reader packed with 85 leveled and sequenced Ooka Island e-Books". The method & this program was developed by Dr. Kay MacPhee, whose first reading intervention program was recognized by the US Department of Education’s, What Works Clearing House, as the top program in the U.S. for developing reading comprehension. That carries a lot of weight in my area. What Works Clearing House is highly respected. I like that the program is very deliberate about activities and the sequence of the activities. Take a look at this graphic. Isn't this what we wish all reading programs did? SO-- let's get down to the nitty gritty! How did the program work with my 3-year-old? Engagement - she absolutely LOVES it! She asks often if she can get play Ooka Island, and she definitely focuses and follows along with it. Effectiveness - in the two weeks that we've been playing around with it so far, she has mastered 9 sounds: oo, ee, aw, sh, m, f, p, oy, and s, & it's added 2 more that she's working on. She's only 3 folks!! I have decided that this would be an excellent resource to add to my classroom!! Piper has already mastered all of those sounds...in only about two weeks...never playing more than 20 minutes at a time...and not even every day!! I'm excited to think about the difference this can make for some of my kiddos in the classroom! Feedback/Reports - You can access reports that give you data about student progress, and can be viewed for individuals, small groups, and whole class. Ooka Island can be downloaded on multiple computers. I'm so excited that Educents currently has Ooka Island for 50% off! That's a great deal! Click to find out more about it at Educents! Disclaimer: This post may contain affiliate links. If these links are clicked, I may receive monetary compensation. If this is a product review, I may have received the product to facilitate my review. No monetary compensation was provided. All opinions are my own & my participation is voluntary. I am disclosing in accordance with FTC 16 CFR Part 255. 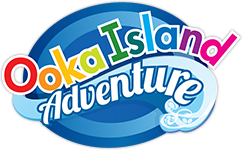 The program looks great, but I went to the Ooka Island website to look at what the pricing would be if I wanted to keep it after the first 6 month trial period that's on sale at educents. It looks like it will be $20 for an annual student license. With 24 students in my class, wouldn't that come to $480 per year just for one classroom? Even if they should happen to continue offering 30% off (the current promotion listed on their website), that's still a ton of money. My PTA doesn't have that kind of money to spend on just one classroom.